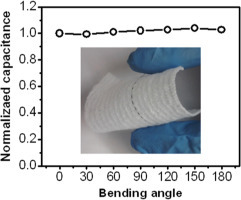 Flexible and wearable wire-shaped microsupercapacitor based on a wire-shaped microelectrode made from a titanium (Ti) wire sheathed with radially aligned titania nanotubes. Wearable power sources for wearable electronics are limited by the size of garments. With that in mind, researchers at Case Western Reserve University have developed flexible wire-shaped microsupercapacitors that can be woven into a jacket, shirt or dress. By their design or by connecting the capacitors in series or parallel, the devices can be tailored to match the charge storage and delivery needs of electronics donned. While there's been progress in development of those electronics--body cameras, smart glasses, sensors that monitor health, activity trackers and more--one challenge remaining is providing less obtrusive and cumbersome power sources. "The area of clothing is fixed, so to generate the power density needed in a small area, we grew radially-aligned titanium oxide nanotubes on a titanium wire used as the main electrode," said Liming Dai, the Kent Hale Smith Professor of Macromolecular Science and Engineering. "By increasing the surface area of the electrode, you increase the capacitance." Dai and Tao Chen, a postdoctoral fellow in molecular science and engineering at Case Western Reserve, published their research on the microsupercapacitor in the journal Energy Storage Materials this week. The study builds on earlier carbon-based supercapacitors. A capacitor is cousin to the battery, but offers the advantage of charging and releasing energy much faster. In testing, capacitance--the capability to store charge--increased from 0.57 to 0.9 to 1.04 milliFarads per micrometer as the strands of carbon nanotube yarn were increased from 1 to 2 to 3. When wrapped with a sheet of carbon nanotubes, which increases the effective area of electrode, the microsupercapactitor stored 1.84 milliFarads per micrometer. Energy density was 0.16 x 10-3 milliwatt-hours per cubic centimeter and power density .01 milliwatt per cubic centimeter. "They're very flexible, so they can be integrated into fabric or textile materials," Dai said. "They can be a wearable, flexible power source for wearable electronics and also for self-powered biosensors or other biomedical devices, particularly for applications inside the body." Dai 's lab is in the process of weaving the wire-like capacitors into fabric and integrating them with a wearable device.